Il ribasso del petrolio fa una strage di vinti. E la Cina riesce a ribaltare la partita. 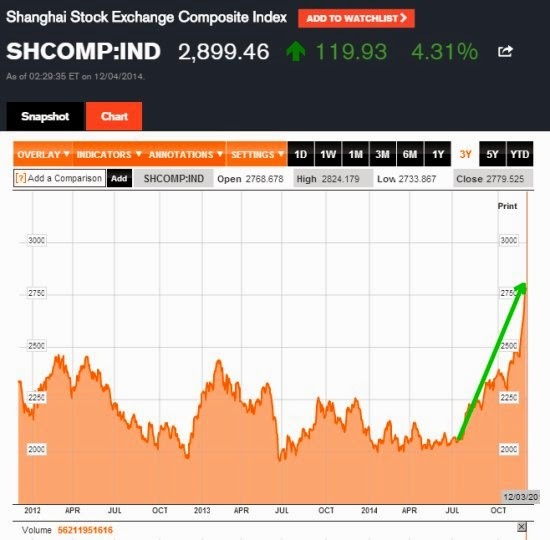 "We Are All In A Ponzi-World Right Now, Hoping To Get Bailed-Out By The Next Person"
ovvero un BOOOM Deflazionario innescato dal crollo dei prezzi del petrolio e dai bassi prezzi delle principali commodities. Secondo me il Boom Deflazionario non avrà vita lunga ma nel breve potrebbe addirittura pompare ulteriormente la mega-Bolla QE+ZIRP già innescata dalle principali Banche Centrali. Inoltre il BOOM al quale mi riferisco beneficerà soprattutto i mercati & la finanza e solo in minima parte l'economia reale, com'è ormai normale in tempi di "finanziarizzazione estrema" dell'economia. 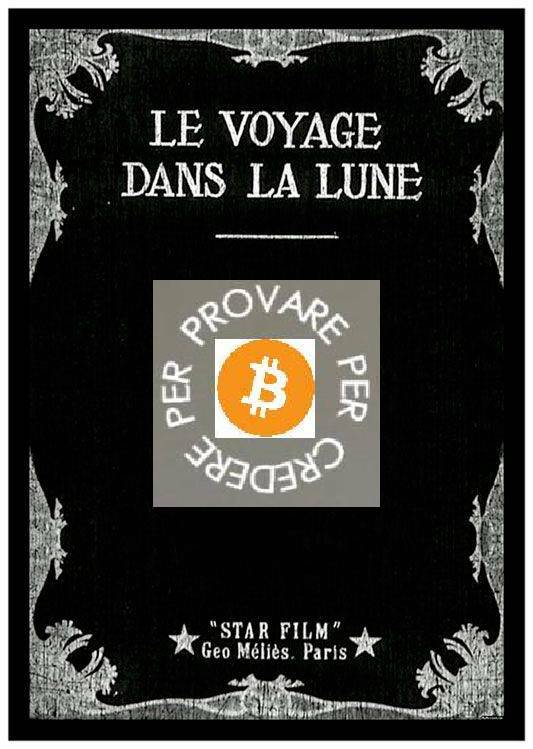 le banche Centrali hanno ben poche spinte ad alzare i tassi e ad interrompere il pompaggio (QE+ZIRP). Al contrario (vedi il caso estremo del Giappone e della BoJ) sussiste addirittura la spinta ad incrementare ulteriormente "l'allentamento monetario" per tentare di innescare inflazione: anche questo contesto paradossalmente alimenta la spinta del Boom Deflazionario. Tutto il Mondo oggi attende la Riunione della BCE e la conferenza stampa di Draghi (ore 14.30). Jon D. Markman of Yahoo Finance reports, Prepare for the rare “deflationary boom” (h/t, Rejean Desmarais):"Deflation" and "boom" are not two words that normally go together. They are almost like "sad happiness," "low-cal donut." But in their very unlikely pairing they appear to do a good job of explaining the unusual economic and market environment that may lie ahead. It’s a term discussed this week by Cornerstone Macro analyst Francois Trahan to describe a rare condition in which a country’s economic activity rises but inflation falls. 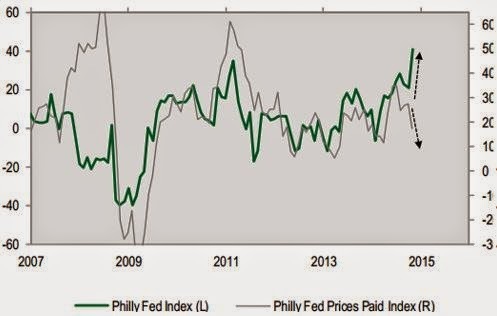 He believes that is the right interpretation of the Philadelphia Fed data released on Tuesday that showed output in the region up but prices paid falling, as shown in the chart below. The improvement of the Philly Fed can be seen in part as a result of the stimulative effect of falling crude oil prices, and their ripple effect on the broad economy. 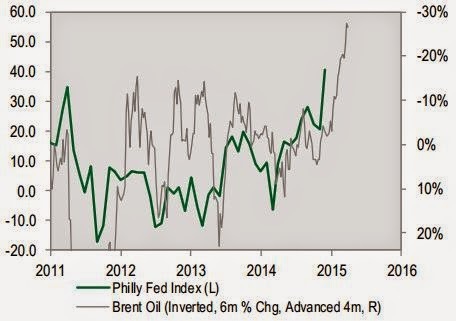 The chart below, created by Cornerstone, shows the Philly Fed Index (green line) charted against the six-month percent change in the price of Brent Oil, advanced four months (gray) and inverted. The oil price is advanced four months to show the lagged effect that oil has on economic activity. In other words, when oil falls in price it takes about four months for the change to have an effect on end users’ decisions. You can already start to see the effect of lower oil and interest rate stimulus in the fact that the last four major economic data releases — Empire Manufacturing, NAHB Housing, Philly Fed and Kansas City Fed — have been better than expected, the first time that has happened in quite a while. What we are starting to see, Trahan argues, is news that demonstrates we are in an “all stimulus, all the time” backdrop, with more boosts to global economic activity coming every day.